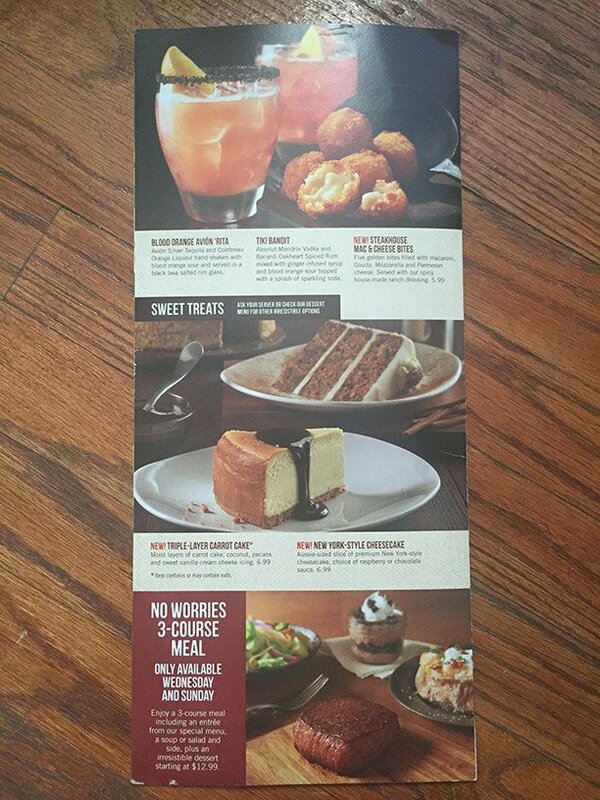 Welcome to your source for the up to date Outback Steakhouse® menu with prices. 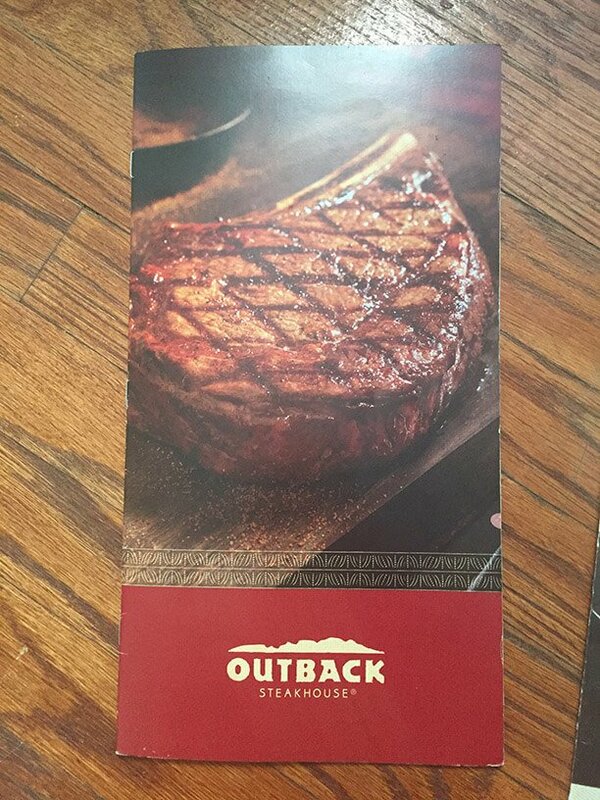 Outback Steakhouse specializes in serving up great steaks and Australian inspired cuisine in a casual dining atmosphere. 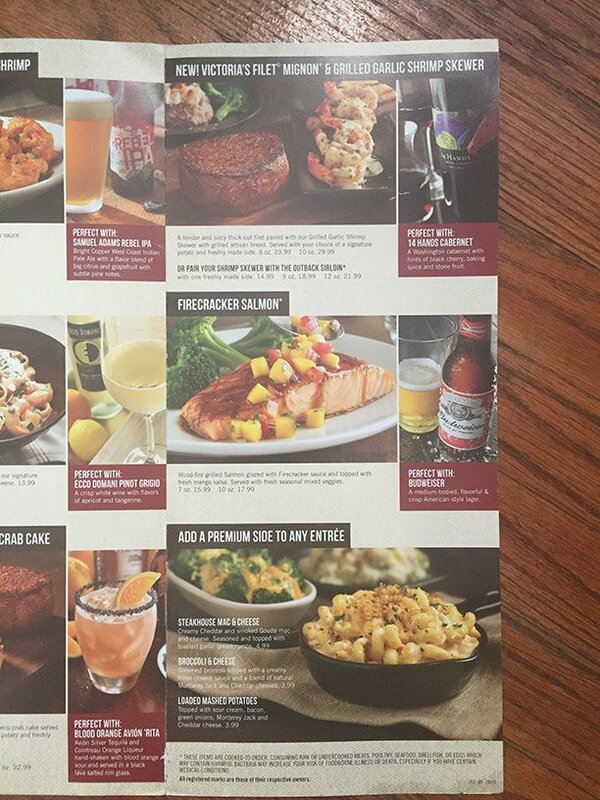 You can enjoy a meal at Outback for lunch or dinner. 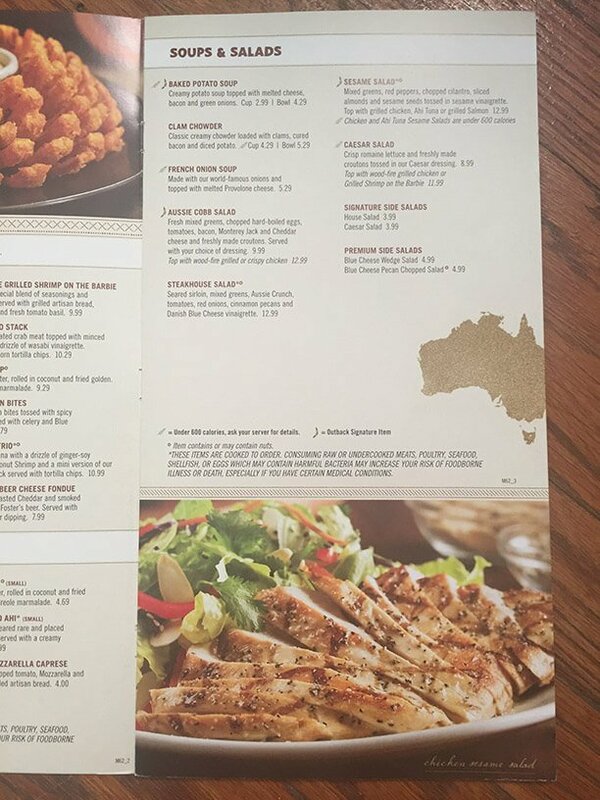 In addition to great steaks that are expertly seasoned and prepared, there are chicken, ribs, seafood, pasta and even lamb entrees to choose from at Outback. With a wide offering of wines and craft beers as well as well as appetizers and snacks, Outback is also a great place to meet up with friends to share a drink and some tasty finger food. The atmosphere is inviting and the staff is friendly and warm. Item contains or may contain nuts. * These items are cooked to order. Consuming raw or undercooked meats, poultry, seafood, shellfish, or eggs which may contain harmful bacteria may increase your risk of foodborne illness or death, especially if you have certain medical conditions. Chicken and Ahi Tuna Sesame Salads are under 600 calories. Perfect with: Two Lands Cabernet A rich, silky cabernet with blackberry and plum notes balanced with a hint of subtle oak. Blood Orange Avion 'Rita Avion Silver Tequila and Cointreau Orange Liqueur hand-shaken with blood orange sour and served in a black lava salted rim glass. Tiki Bandit Absolut Mandrin Vodka and Bacardi Oakheart Spiced Rum mixed with ginger-infused syrup and blood orange sour topped with a splash of sparkling soda. Ask your server about the seasonal draft beer selection. 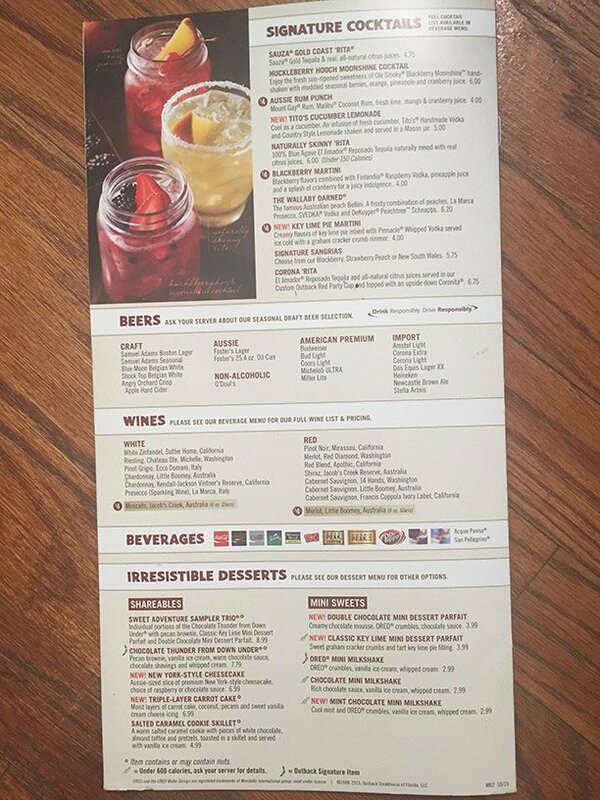 Please see the Beverage menu for our full wine list & pricing. 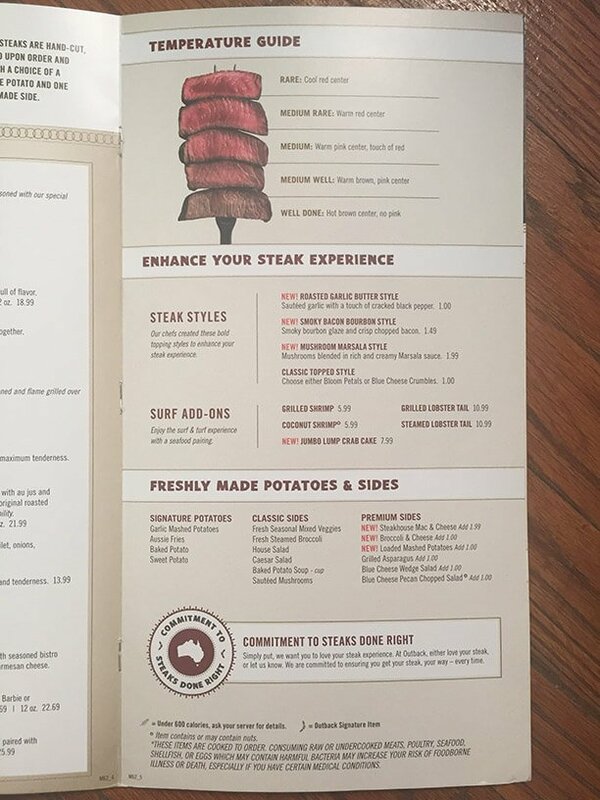 Outback is a great place to have a steak. You can count on the quality of the meat and preparation to be high and consistent. However, don’t let that stop you from trying something new off of their large menu on your next visit. 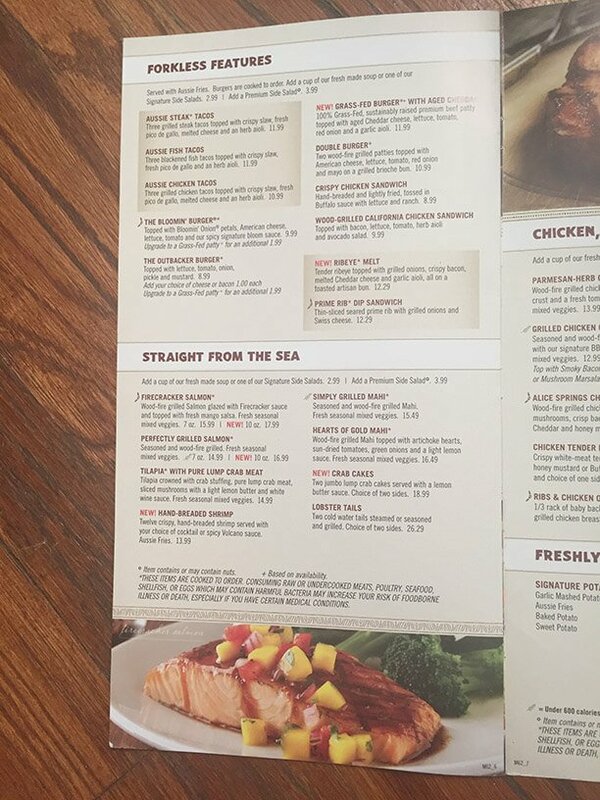 If you are looking for some seafood, Outback has crab, lobster, tilapia, salmon, shrimp, and Mahi prepared in a variety of ways. 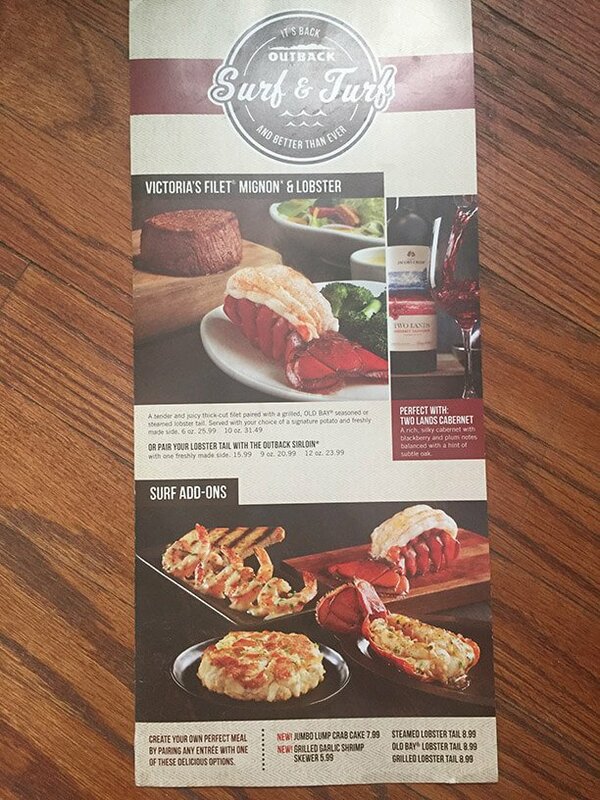 You can make any meal on the menu a surf & turf with several options to partake of something from the sea. There are also burgers, salads, and ribs on the menu as well as a strong selection of side dishes and desserts. This fried onion starter is part of what put Outback Steakhouse on the map. An onion is carved but left together so that when it is fried the little petals of onions bloom outwards so that you can grab them and dip into the specially seasoned bloom sauce. $8.49. This entrée is rich and decadent. The filet is thick cut and grilled to perfection just the way you like it. The crab cake is made with jumbo lump meat and paired with a lemon butter sauce. This meal comes with a side of your choice and two meat portion sizes to match your appetite. The 6 oz. filet is $24.99 and the 10 oz. is $30.49. This generous portion includes 1/3 of a rack of ribs and a chicken breast finished on a wood-fire grill. You will appreciate the bold combination of flavors in this dish. It comes with a side, we recommend trying the Garlic Mashed Potatoes, for $15.49. You probably won’t have much room after your meal, so the mini dessert options are a great way to finish sweet, without feeling bloated. We recommend the Key Lime parfait for $3.99. Friends Bob Basham, Chris T. Sullivan, Trudy Cooper, and Tim Gannon founded the first Outback Steakhouse in Tampa, Florida in 1988. It was soon acquired by Bloomin’ Brands and the chain expanded rapidly, both domestically and abroad. 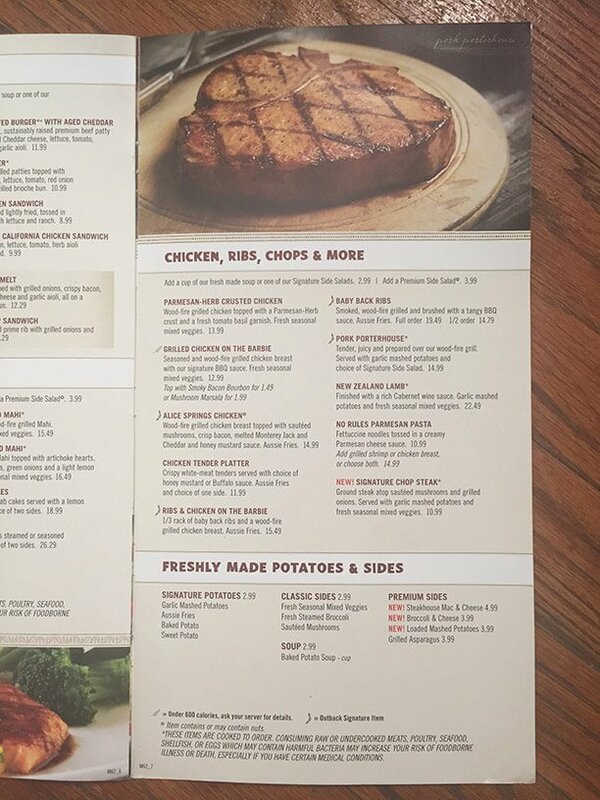 Many people came to know Outback Steakhouse through their long running television adds that featured the “No Rules, Just Right’ motto that became deeply associated with the brand. 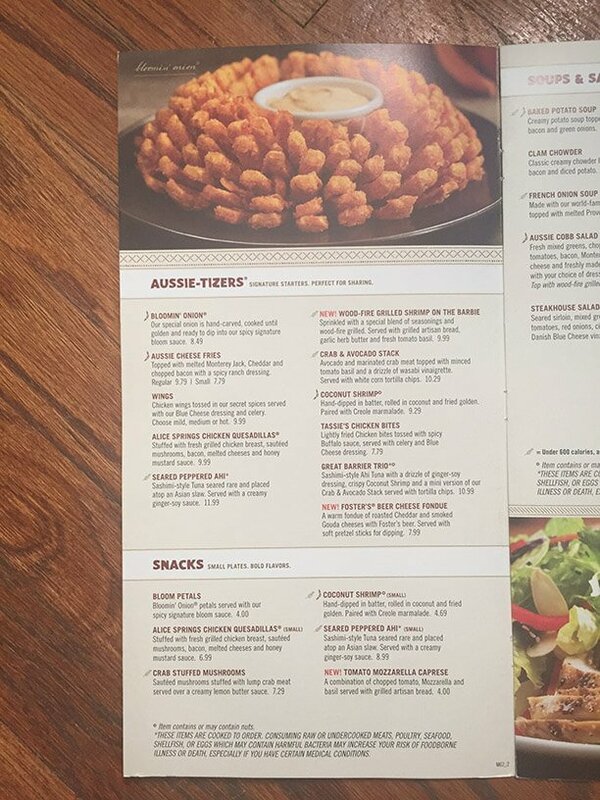 In addition, Outback has partnered with major sporting events, sponsoring the Outback Champions Series tennis, the Outback Bowl in NCAA football, and Ryan Newman’s NASCAR #39 car. The first international location of the chain was launched in Canada in 1996. As of 2013 there were 979 Outback locations, including restaurants in 15 nations. 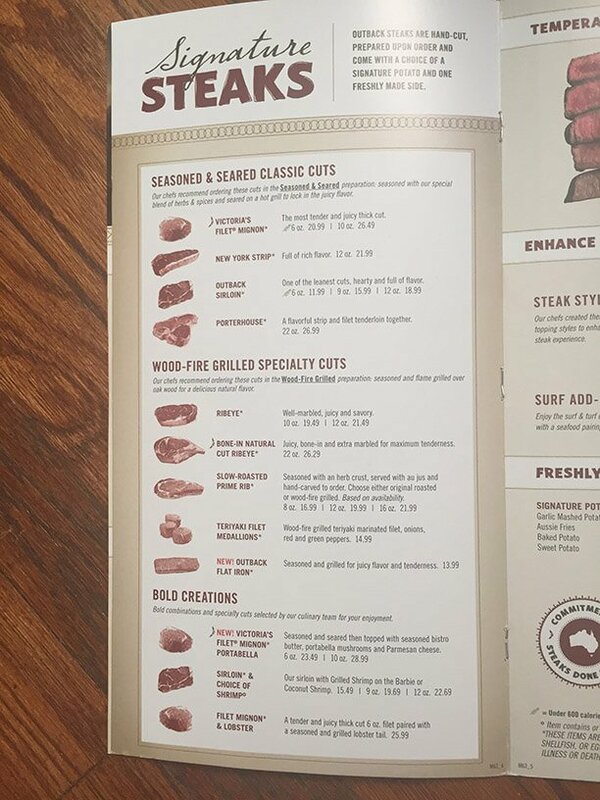 Outback Steakhouse menu prices are subject to change without prior notice. Prices shown in images & the following table should be seen as estimates, and you should always check with your restaurant before ordering. 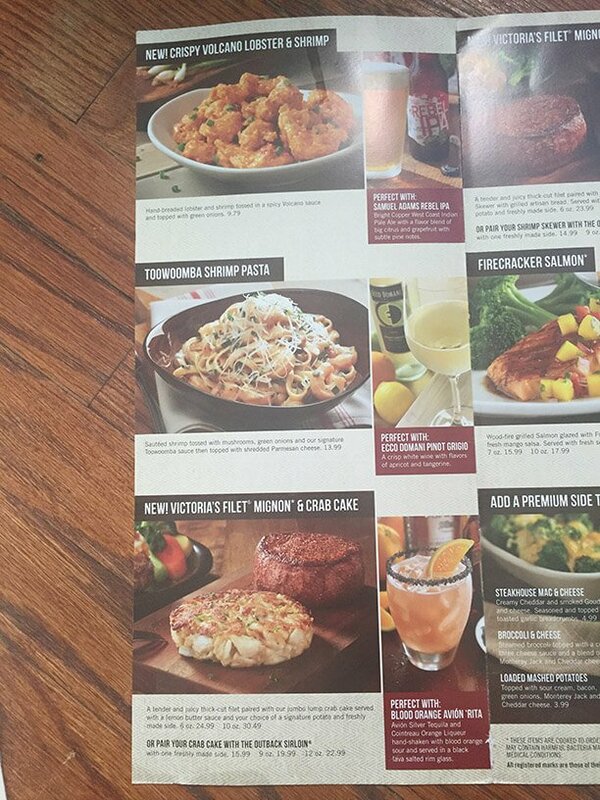 Outback Steakhouse menu images sourced via e-mail from restaurant customer & menu-price.net user. menu-price.net does not guarantee the pricing or availability of any menu items listed in image or table format on this page. Pricing may vary from location to location.